This "is his best novel and perhaps that most elusive of creatures, a great American novel." Ah, our sad spinning globe...worn ragged by wars, bruised and dirtied by technology. Don DeLillo grabs it, still spinning, on its flight of October 3, 1951. Grips it like a knuckleball pitcher. One fingernail dug firmly into the historic Giants-Dodgers playoff game. Another nail dug into the first successful Soviet A-Bomb test. He holds the orb up, examines it like Lenny Bruce pondering a rap, and lets fly a granddaddy of all butterfly pitches. Swing. Try and connect with it if you can. You're sure to get a piece. Whistling vortexes grabbing at this globe's seams. It ducks towards the life of Nick Shay, son of a small time bookie, who is trying to deal with his father's disappearance. It dodges toward Klara Sax, a woman struggling to find her identity as an artist. It hops around Nick's family and neighborhood, and dashes into the future, and the past. And when you swing at it, it turns into the smiling face of Lenny Bruce, shrieking "We're all gonna die" and then into the Mona Lisa smile of an obscure junkie, who IS about to die. And, oh, it turns into Bobby Thomson's home run ball, bouncing through bleacher seats, about to change into a holy grail, provenance unkown. The novel's structure is like a shuffled deck made of cards from its characters lives. The narrative, at one point, swirls past that famous monument to found art - the Watts Tower and takes on its magic, dazzling the reader as bits and pieces of multiple characters' pasts and futures come together and suggest grander themes concerning ...the environment? ...capitalism?...the human comedy? The best parts of Underworld (the very best were the Lenny Bruce monologues) reminded me of the lyricism of The Great Gatsby and On the Road. Boats being beat back by the current; the land stretching away beyond New Jersey... and God as Pooh Bear. Not only was this book a bestseller, you can find superlatives among the blurbs like "great American novel" and "thrilling page-turner." This book was runner-up in a 2006 New York Times survey of eminent authors and critics for best American novel in the last 25 years. All I can say is I felt about this novel the way I do about many a purported masterpiece hung in the Museum of Modern Art. Good God, why? By the end of a short section after Part One, 150 pages in of 827, I knew this book wasn't for me and stopped reading things through. (I did skim through the rest though.) I read even that far because the novel was on a list of literary fiction I'd been working through. I knew it was considered a difficult work and wanted to give it a fair chance to win me over. Otherwise, I would have stopped at the second page of story. He has never done this before and he doesn't know any of the others and only two or three of them seem to know each other but they can't do this thing singly or in pairs so they have found one another by means of slidy looks that detect the fellow foolhard and here they stand, black kids and white kids up from the subways or off the local Harlem streets, lean shadows, bandido, fifteen in all, and according to topical legend maybe four will get through for every one that's caught. Ah yes, the beloved run-on endless-sentence-of-doom, which, like the very doorstop length of the book, is supposed to demonstrate profundity. Let's have another sentence shall we? The faces of the ticket sellers hung behind the windows like onions on strings. Some are jumping, some are thinking about it, some need a haircut, some have girlfriends in woolly sweaters and the rest have landed in the ruck and are trying to get up and scatter. This is in reference to 15 boys jumping the turnstiles to see a baseball game without paying for a ticket. So how is needing a haircut or having girlfriends in woolly sweaters relevant or add to the narrative at this point? All these quotes are from the Prologue of 60 pages that was published separately as "Pafko at the Wall." Even some reviewers who counted Underworld a mess thought that section brilliant. So if you don't find that Prologue a work of genius I don't think you're going to be in love with the rest of the book. The bulk of the book then deals with the man who ultimately bought that baseball--Nick Shay--who is in waste management. When we turn to him in Part One, the omniscience of the Prologue with touches of second person turns to first person for this part, but there are still a lot of the hallmarks of the prose style of the Prologue. We get this long rambling scene in this part about condoms. The first person narrative is more accessible, but still at times disjointed, and we're headed to another extended metaphor: American culture as trash. You can tell looking at the section title pages that the main story is non-linear; like Pinter's Betrayal or the film Memento you work yourself backward from the early 90s to the early 50s in each of the 6 parts until you hit the epilogue set in the near future. After Part One, the point of view will shift again between first and third person. Nothing about this book is straightforward--not the prose, point-of-view, narrative, characters or the very thin plot. After being unimpressed by Falling Man I was a bit of a Don-sceptic, and remain so. I wanted to love this book: I love the ambition of it, the size of the themes (in a nutshell, American life in the second half of the 20th century) and the need to deal with them as a whole, the crunch in some of the writing, and much of the scattershot approach. One section, a collection of “fragments Public and Private in the 1950s and 1960s”, I thought excellent, putting across a captivating picture of a time by magnifying scattered episodes in the various characters’ lives. It was a condensed version of what I think the book as a whole hoped to achieve but, imho, generally didn’t. I think there are some pretty big flaws in the book. The main one is that the characters are rarely, if ever, engaging. I didn’t care where Nick Shay’s father had gone, nor how he ended up in a juvenile detention centre (not spoilers btw, points brought in early on), or about any of the characters except the boy who grabs the baseball at the book’s beginning, and his father, who recurs in three episodes. For a book over 800 pages long, this is a big deal – losing the traditional linear narrative is fine, fitting even, but the reader losing empathy for the characters is fatal. Often they seemed too weighed down by the books’ themes to breathe, and the knock-on effects in getting involved with them (and by extension those themes) becomes difficult. By the last hundred and fifty pages, I just wanted it to be over. Another beef is that a lot of themes and plot points are raised and then fall away, or come to nothing – there is an irritating preoccupation with the number 13 that seems to go nowhere except to portray a vague sense of doom and weakness in the face of fate. A plotline about a highway murderer doesn’t fulfill its promise; the media preoccupation with a movie of one of the killings echoes that surrounding the Zapruder film, which itself makes an appearance later in the text, but this display of a changing culture and the sources of its obsessions didn’t feel very satisfying. I was never far away from thinking “Yes, I see. And your point?”, and that ain’t good. That’s not to be totally disparaging, far from it; there’s some superb writing throughout (even the bad bits are written well, and the good bits, particularly the baseball game and the scenes with Lenny Bruce’s comedy routines, are brilliant), and it constantly seeks to challenge, which is a fine thing. I’d say there’s a lot to study here, and that’s both a mark of respect and an alienating thing – I can imagine someone writing a big essay on this book and taking more from it with further and deeper reading, but it’s hard to imagine someone loving it. Personally I don’t think I’d want to go back to it, or that it will live particularly long in the memory. One of those books that is intelligent and well-written and has a lot to say, but is actually also really boring. I think I’ve resigned myself to the fact that I will never be a Don DeLillo fan. 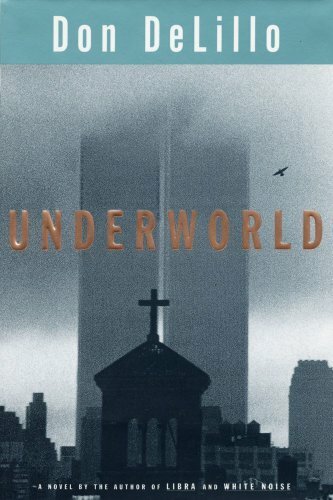 Don Delillo’s cold-war opus, Underworld, leaves me underwhelmed. The scope of the novel – over 800 pages, divided into prologue, seven main parts, and an epilogue, littered with over 100 characters, spanning from the 1950s to the dawn of the internet-era in the 90s – just did not hang together for me. There is a certain flatness and thinness that mires the total-effect of the narrative; it’s difficult to divine the basic thrust linking all these themes (the mind-numbing hum of 20th century technological America, mortality, nihilism, violence, marital infidelity, love, luck, etc.) and all these sundry minor characters that Delillo summons to stand for them (the Texas Highway-Killer, for instance, appears throughout the middle of the book for several lengthy sections but seems to have no bearing on the book as a whole). But perhaps this sense of sprawling disjunction is precisely Delillo’s desired effect. Delillo is here, as elsewhere, interested in the historical—“longing on a large scale is what makes history” (11)—which precludes centering a novel on a single character, relationship, or theme. If the book has a “hero” (although the counterpane’d texture of it would seem precisely to preclude any gestures of classical heroism) it is the Hemingwayesque Nick Shay. Nick, or Nicky, as he is known in the 50s-era Bronx parts of the book, is, like many Delillo heroes, a twist on the classical all-American guy; he’s got a family, a wife, kids, and a corporate job, but a past, a sin, a violent secret (the killing of a man in a bar when he was seventeen) that separates him out from the typical grain. These are 827 pages that I never wanted to end. The gorgeous writing and kaleidoscope of ideas have the effect of a revelation. I now - unwillingly - compare all other books to this one. This needs some explaining. After rating many hundreds of read books, this one had me the most perplexed as to how to rate it. I was thinking, either a 3 or a 5. A three>, or a five?! It was suggested I average it out as a 4, but that seemed to me to just misrepresent both ratings. Underworld, by Don DeLilo (1997), is a colossal book, written on a colossal scale. Having just finished the book I am left wondering whether it actually holds together. First of all, it needs to be noted that Underworld is over 800 pages of brilliant prose. There's no taking that away from DeLilo. Each sentence is structured beautifully and the dialogue is word perfect. The ingredients of the book are strong. It's the connective tissue, the plot, and the sometimes tenuous linkage of themes, which ultimately leave something wanting for me. I'm a big fan of DeLilo, so I'm used to the eliptical choppiness of his writing. Much of DeLilo's writing can be viewed as pastiche, with deliberate mixing of styles. Deadpan depressive passages brush up easily against patches of black humor. White Noise, for example, has chapters of beautiful descriptive weight, followed by pure bathos, undercutting what has gone before. The deliberate disjunctions of Great Jones Street and The Names (two of my favorite DeLilo books) represent an attempt to approach a single subject from multiple perspectives, and are effective because the books are short enough for the reader to remember, contain, and make the connections which DeLilo leaves out. But in Underworld there are parts which just don't seem to fit in at all. This problem, coupled with the sheer length of the book, makes it hard to contain the story, such as it is, and makes me think that the book would have been better had it been edited down. It's a compendium of too much. Underworld starts off with a lengthy Prologue, telling the story of the famous 1951 World Series baseball game which culminated in the home run by Bobby Thompson, famously dubbed “The Shot Heard Round the World”. Present at the game are J. Edgar Hoover, Jackie Gleason, and Frank Sinatra, sitting together. While at the game Hoover gets news of another shot from the other side of the world, the first test firing of an atomic bomb in the Soviet Union. Both “shots” serve as plot structures in Underworld. The fate of the baseball as it lands in the stands and is fought over and changes hands is one thread leading out. The other thread is the nuclear theme. After the home run spectators shower the field with paper. A large page from Life magazine lands on Hoover. It is a double page spread of Hieronomous Bosch's grotesque painting, “The Triumph of Death.” Hoover is mesmerized by the scene. Much later, in the book's Epilogue, Nick (the main narrator) visits a present day nuclear waste facility in Kazakhstan and is shown a facility which houses the actual freak show of deformed patients which Hoover saw in the Bosch painting. Nick, of course, is unconnected to Hoover, apart from his owning what might be the actual baseball from the actual World Series game. Such are the tenuous plot connections. As in Pynchon's The Crying of Lot 49, waste is a dominant theme in Underworld. Nick's job is in waste management, and much of the book is a meditation on the byproducts of consumer culture. Another theme which DeLilo shares with Pynchon in Underworld is that of betrayal, a theme which Pynchon explores so well in Vineland. The first betrayal in Underworld is by a father who sells the famous world series baseball which his son fought over and brought home. Other betrayals between husband and wife resonate throughout the book. None of the book is chronological, jumping around from early fifties to the mid nineties in freewheeling style. Elements of theme are eked out slowly, and the plot follows a backward trajectory. DeLilo has always been good at describing landscape in such a way as to infuse it with the innermost musings and fears of his characters. Arroyos, hinterlands, desert wastes, unmapped areas and estuarial minglings are powerful metaphorical repositories of experience, as are rooftops, waste lots and heavily peopled Bronx neighborhoods. I started out really loving this book. At 827 pages, it was quite a commitment and it came at just the right time - I was looking to totally immerse myself in a story of epic proportions. While it started out that way, it didn't hold my interest quite as well as I'd hoped. If this book is any indication, there's no questioning DeLillo's place among the great living literary legends. He is an expert manipulator of the English language and he managed to make it easy to keep track of dozens of characters. The fact that this book centered around a baseball game didn't hurt either. I did enjoy reading this book but it also felt so massive, so serious and so “Very Important”, that I felt overwhelmed by it, and found myself needing to put it down and pick up another book, for days at a time. I've felt this way about books before, but with other books it's been a case of being emotionally exhausted by an extremely intense narrative. In this case, I just got tired of listening to him wax philosophical. There should be a "read-enough" shelf. I do not like this book. I didn't like it while I was reading it, I'm not liking it while I'm thinking about it, I resent it sitting on my bedside table taking up vaulable book real estate. I cannot recall what it is about and I don't think I even understood while I was actively reading it but it's been so long I just don't know. The writing, as it were, is on the wall. I'm giving up on this terrible, terrible book. Underworld is a stream of consciousness novel, but with a caveat: I don't mean the consciousness of an individual, but collective consciousness, the consciousness of a nation over the course of several generations. Reading this novel is a peculiar experience because I didn't get especially emotionally connected with any of the characters, and I got the sense that I as a reader wasn't meant to. Instead, characters wander in and out of the story, living their own lives without regard for the audiences' witness. The common threads that run throughout the meandering narrative are tentative: all about present tension and future anxieties that cannot quite be named, but are undoubtedly there. Characters live lives characterized by "the faith of suspicion and unreality. The faith that replaces God with radioactivity, the power of alpha particles and the all-knowing systems that shape them, the endless fitted links." It's quite modernist, this certainty that there's something in the world that's still worth pursuing but with deep uncertainty about what that might be. What a long, strange trip it is. Extraordinary, and truly unique. Its power comes from the layering of seemingly disparate story lines and characters back and forth in time and place. The cumulative effect is ultimately staggering. My wife asked, "What's it about?" and I didn't know where to begin. A baseball? The Cold War? Garbage? Family? Technology? Government and corporate intrusiveness? Marriage and relationships? Crime and punishment and rehabilitation? Art? Race? Celebrity culture? New York City? America? History and memory? Whatever. It doesn't matter. It's an exhilarating and unforgettable joyride. A baseball - that connects so many lives. Too many. Had a hard time keeping up with all the different characters and the time jumps. It's worth 800-odd pages just for Lenny Bruce screaming "WE'RE ALL GONNA DIE"! And the "shot heard 'round the world" part is pretty incredible too. Further opinions forthcoming on a pending reread, but I read it 7-8 years ago and those are the parts that have stuck with me. The depiction of all of the different times and places (including various scenes in New York City) within the later half of twentieth century America are all very sharp, distinct, and vivid. The bomb, the baseball, and wasteland America. : Nominated for the National Book Award, Don DeLillo's ambitious 1997 historical novel tells the story of Nick Shay, a Phoenix waste management executive, who lives a meaningless life in late 20th Century America, a land of ever-accumulating garbage. (Phoenix becomes a microcosm of existential angst and wasteland America.) His wife, Marian, is having an affair with one of his friends. The novel spans five decades of American history, from the 1950s through the 1990s, opening on October 3, 1951, when a young man named Cotter Martin catches a ball known as "The Shot Heard 'Round the World," after sneaking into a New York Giants-Brooklyn Dodgers baseball game. Jackie Gleason, Frank Sinatra, J. Edgar Hoover, and Lenny Bruce are also in attendance. As Bobby Thomson was hitting his pennant-winning home run, the Soviets were meanwhile detonating the atomic bomb that put 1950s America in fear of nuclear war. When the story then turns to two lovers in the Nevada desert in 1992, we learn that Shay (who now owns the baseball) served time in a juvenile detention center for murdering a man, before attending a Jesuit reform school in northern Minnesota. Underworld is fascinating look at the effect of the Cold War on the American psyche. It reveals the author of [[ASIN:0140283307 White Noise]] at the top of his form, and DeLillo's brilliant vision of American culture left me in awe. I first experienced the work of Don DeLillo in a college class on postmodern American literature. White Noise was easily my least favorite of the novels we read that semester...and yet, for some reason, I keep coming back for more of DeLillo's work. This is the fourth book of his that I've read, and it suffers from the same problems I have with each of the others. First off, DeLillo's style always leaves me with the feeling that he's just trying too hard. Yes, this does result in some amazing prose, but only in places, and not enough, in my opinion, to justify the off-puttingness of the rest of it. Most writers edit their work to make it more clear; I feel like DeLillo edits his work to make it more obscure. I feel like he's more concerned with the language than he is with the story. There's a balance to be found there, and he just rarely strikes it for me. On a somewhat related note is that I just never really feel like DeLillo's characters are real people. For me, good literature begins with vivid, real characters--not necessarily likable, but believable, flesh and blood humans in all their glory and fallibility. That's something I've never found in any of DeLillo's work. Now, I know that one theme of postmodern literature is disconnectedness, so maybe that's intentional on his part. I can respect that, but it leaves me cold. I get to the end of the book, and all I really feel is "eh." Now, all that said, there's definitely something about this book. It has a grand scope, painting a picture of America from the beginning of the Cold War through the beginning of the Internet age. There's no questioning its ambition. It also has some interesting things to say about waste, about war, about culture and environment, and about threads that run through our lives. It was worth reading; I guess I was just hoping for more from a book I had heard so many good things about. In the summer of 2012 I listened Independence Day, which I despised with forgetful disdain. In the spring of 2013, unfortunately, I am struggling to get into a second listen, much as I love it, because it has the same narrator (who is fine!). My, what a voluptuous tome. Manifold story lines reveal the story of America in the 2nd half of the 20th century. -recurring motifs of waste and baseball and Cold War- very difficult read (too much like short story collection in parts) and I admit to skimming a few chapters in the 2nd half, but oh so well written. This is a very disjointed book. The skipping back and forth makes the story-line difficult to follow. I finished this novel but I would not recommend it.